This week we had a Teddy Bear's Picnic to complete our topic called 'Scrumptious.' 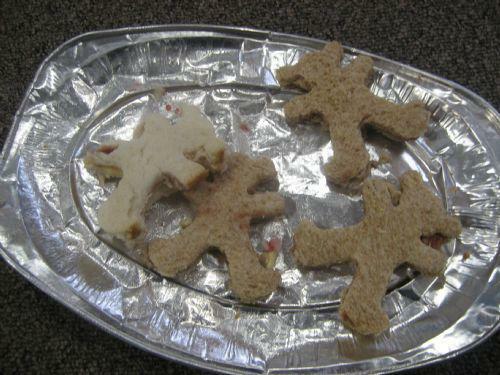 We made jam sandwiches in the shape of Teddy Bears. This week we have been learning about Healthy and Unhealthy food. We sorted lots of different food. We played fruit bingo too! We tried hard to match the fruit and name it! This week we have been reading 'The Gingerbread Man.' We loved reading the story and we learnt to shout "RUN! RUN! As fast as you can! You can't catch me I'm the gingerbread man!" 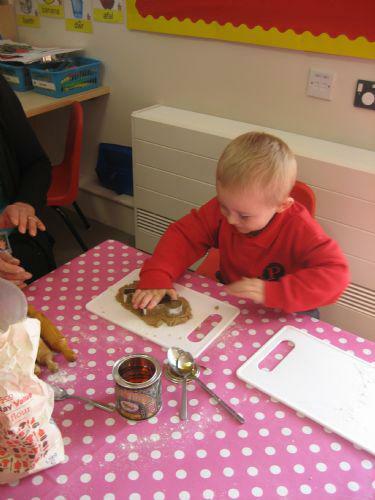 We made Gingerbread Men and decorated them too! The Dentist Lady came to see us this week. She told us that we must brush our teeth EVERYDAY to keep them clean and strong! 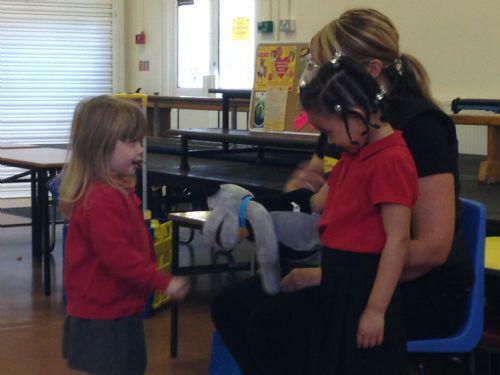 she showed us how to brush our teeth and we tried on the giant teeth! We are going to ty to remember to brush our teeth everyday! This week we have been reading 'Jack and the Beanstalk.' 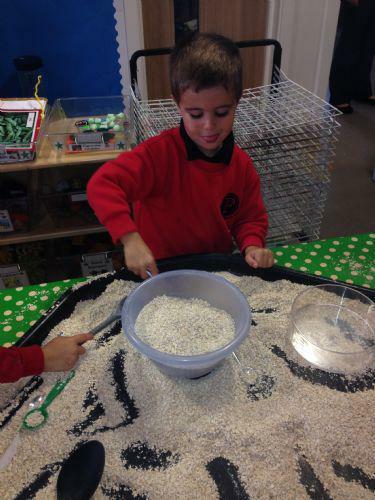 We sorted lots of difefrent size beans and we used words like 'big' and 'small.' We had beans on toast for snack too! It was yummy! This week we have been reading 'Goldilocks and the Three Bears.' Miss Woolley read to us and we look at the pictures by ourselves. We talked about different sizes and why daddy bear couldn't sleep in baby bear's bed. We played with porridge oats too! Filling up different size bowls with different amounts. It was very messy! 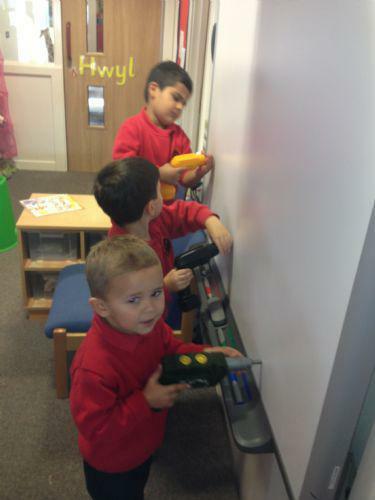 This week we have been learning to recognise and sort colours. Miss Woolley put lots of different fruit counters into 'Gelli Baf' and we had to use tweezers to pick them up and sort them into the matching colour sorting dish. It was very tricky but we tried very hard. The 'Dogs Trust' also came to visit us this week. She showed us lots of pictures of dogs that live at the 'Dogs Trust' and told us that we must never touch dogs that we see unless we ask their owners. We sat very quietly and tried to listen carefully! 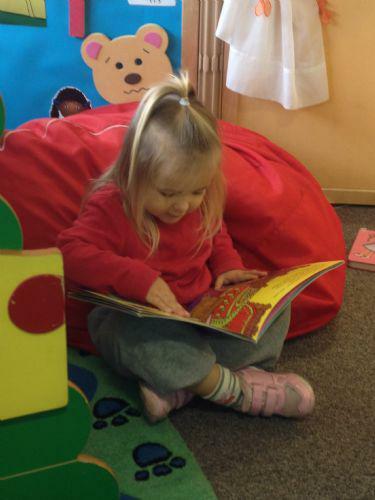 This week we have been settling back into Nursery life. Miss Woolley has introduced us to lots of new friends! We have been doing lots of different activities so that we can put our work up in our classroom. We have had lots of fun. During this topic we will be learning about lots of different foods. We will taste and smell lots of different foods using lots of exciting words to describe them such as; hot, cold, sour, sweet etc. 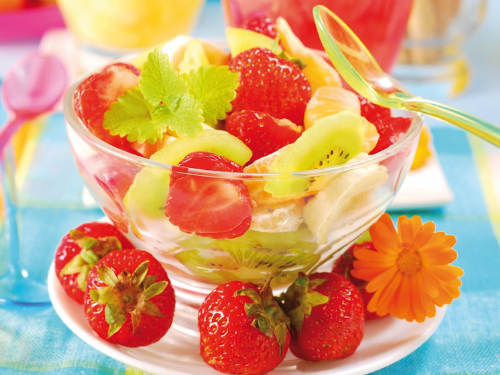 We will also be taking part in lots of activities that will further our understanding of the importance of a balanced diet, food from different countries and lots more! We will finish our topic with a big teddy bears picnic!! Watch this space for updates! !